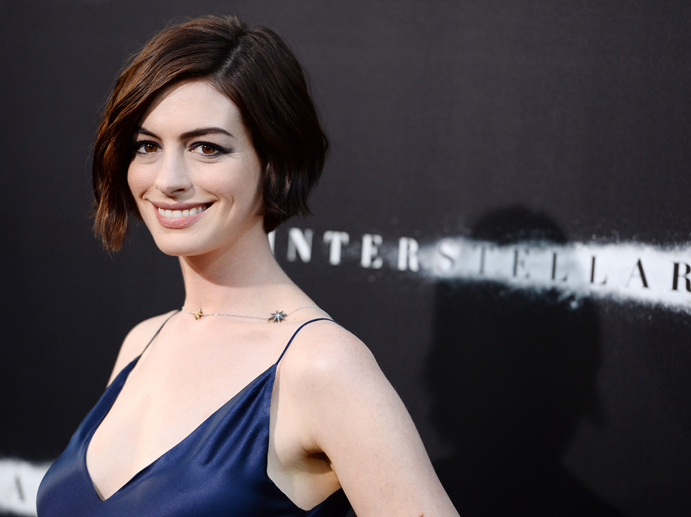 Anne Hathaway rolled up in a ’90s chic beauty concept for the red carpet premiere of “Interstellar.” Celebrity hairstylist Adir Abergel created the look for her using Leonor Greyl products. “First, I started by applying Leonor Greyl Mousse au Lotus Volumatrice from the roots to mid-shaft to create volume and memory to the style. I didn’t apply any mousse to the ends of her hair to keep the weight around the structure of the head, right around the roots. Then, I created a deep side part following the arch of her brow. I applied Éclat Naturel on the ends to give it a little more separation but at the same time protect the hair from heat styling and then used a diffuser to dry her hair completely, making sure to scrunch the hair so that the natural texture came through. Once her hair was completely dry, I used a 3/4-inch curling iron and created a soft, defined wave by winding it around the iron. The secret to this kind of look is to curl from the roots to the midshaft, leaving the ends out. It’s really about just creating movement and a very loose wave, rather than a curl. This adds amazing texture and separation to give it that effortless style.